It is the markings on the petals that give Phalaenopsis hieroglyphica its name. 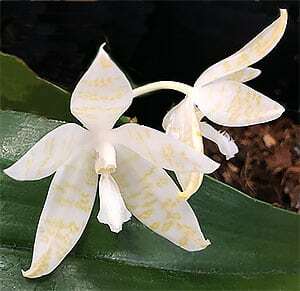 The petals vary in colour on this Phalaenopsis species from a pale yellow and white, the contrasting markings also vary from a range of pinks to yellows, always transverse on the petals. Phalaenopsis hieroglyphica var. alba is white with yellow markings. This fascinating orchid is from the Philippines and nearby areas, the flowers are fragrant, and it is a fairly easy to grow species. It has an interesting habit of being able to reshoot from the old flower stems, so these are not pruned away unless obviously dead. These are naturally an epiphytic orchid, and will grow well in a slatted orchid basket. They also grow well in pots and many growers find this easier. Good filtered light is essential and these are a warm growing orchid that require good humidity. The growing medium should never completely dry. Always water with room temperature water and fertiliser every week with a 1/2 strength solution of a general orchid fertiliser during the growing period. Soil – Either mounted or in a bark growing medium. Flowers – White to yellow with markings.